We are excited to announce the release of the new Power BI content pack for Azure Enterprise users which enables exploration and analysis of consumption data for enterprise enrollments. The data will be refreshed automatically once per day. The ability to specify a time range up to 36 months. The content pack now includes Marketplace, Balance, and Summary data for the time range specified. Price sheet data for the current billing period has also been added. Addressed bugs in the previous version, as well as increased stability and performance. 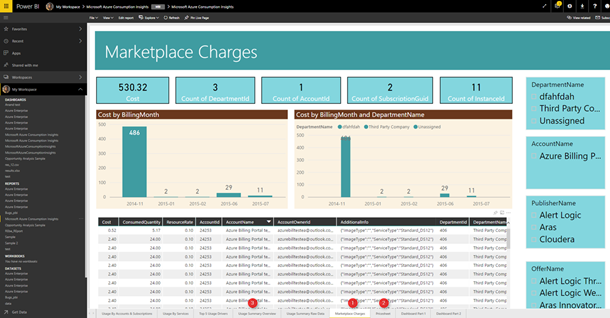 Navigate to Microsoft Azure Consumption Insights and click Get It Now. Provide Enrollment Number and Number of Months and click Next. Provide your API access key to connect, see details below. The import process will begin automatically. 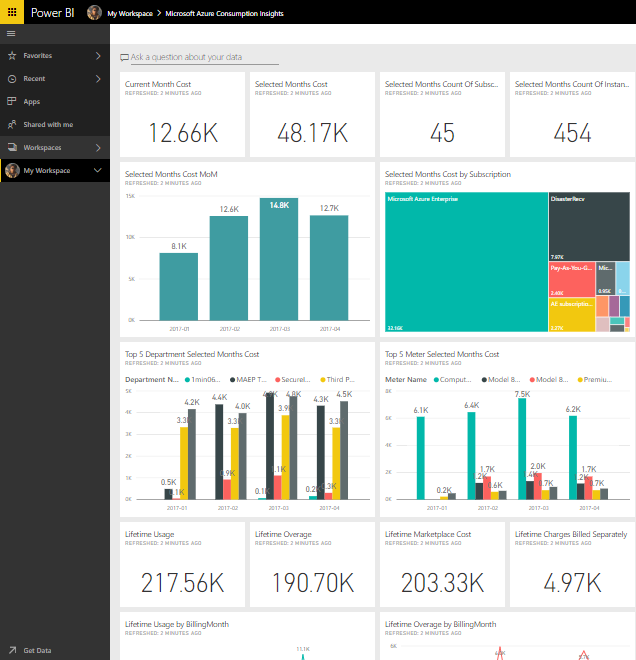 When complete, a new dashboard, report, and model will appear in the navigation pane. Click the dashboard to view your imported data. For more information on how to generate the API key for your enrollment, please visit the API Reports help file on the Enterprise Portal. As always, please reach out to us on the Azure Feedback forum (add #pbicp2) and through the Azure MSDN forum.